DESPITE hailing from different countries, Gatton's newest doctors share the same professional goals. 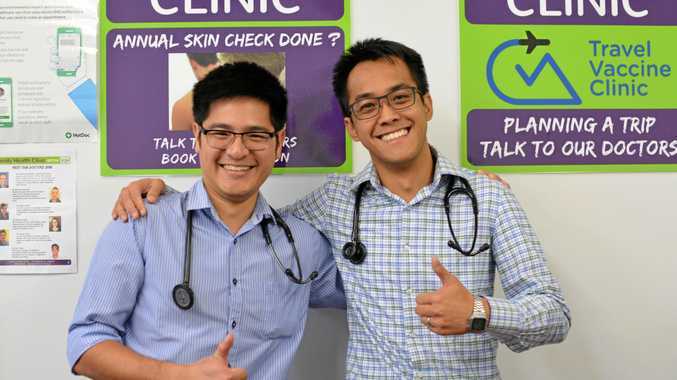 In fact General Practitioners Dr Leon Tang and Dr Joseph Chua have much more in common than recently joining the team at the Family Health Clinic in Gatton. Both are 29-years-old, studied medicine for six years and have previously worked in hospital emergency departments before taking the opportunity to put their medical knowledge, skills and experience into practice in the Lockyer Valley. Originally from Singapore, Dr Chua studied medicine at the University of Adelaide and after graduating in 2013 he made the move to Brisbane. "I love working in a general practice compared to hospitals,” he said. "Being a GP is more about continuity of care and getting to know patients personally and their family. It was Dr Chua's big brother who inspired him to become a doctor. "My brother is an emergency doctor ... he got me interested in medicine and I learnt a lot from him,” he said. Though he's only being in town for three weeks, Dr Chua is enjoying his time in Gatton. "It's pretty good so far,” he said. Similarly to Dr Chau, Dr Tang became a doctor due to family influence as both parents were doctors. He began his journey in Malaysia studying at the International Medical University in Kuala Lumpur. At aged 21 he moved to Brisbane and finished studying at the University of Queensland under a medical training program. "Gatton is a pretty nice-cosy town ... I'm excited to integrate into the community and to make a difference,” he said. Dr Tang said he looked forward to the rest of his journey as a GP. "It's a very rewarding career and I haven't looked back on the decision of becoming a doctor ever,” he said.